These days, subwoofers come in all shapes and sizes. On the one hand are huge models with amps in the multikilowatt range. These subs tend to have massive drivers and can plumb the depths with ease. They also have huge prices. On the other hand are tiny subs that measure no more than 12" in all three dimensions but have powerful amplifiers. These amazing little cubes can also play really low. And they, too, can cost a lot of money. A seemingly impossible challenge for any subwoofer manufacturer has been to provide great performance in a small package and at a low price. In the Omni S8 subwoofer, Mirage Loudspeakers has met two of these goals right off the bat: small size, rock-bottom price. But does the Omni S8 provide great performance? The Omni S8 is built near Toronto, Canada, by the Mirage Loudspeakers division of the huge speaker manufacturer Audio Products International, which also makes speakers under the Energy and Athena brands. With a list price of $350 USD, the Omni S8 is near the bottom of Mirages subwoofer range. The S8 is tiny: 12"W x 14"H x 14"D. And because its front grille is offset from the front by about 2", the volume of the subwoofer itself is only about one cubic foot. The Omni S8 has a front-mounted, 8" Polypropylene Titanium Deposit Hybrid (PTDH) cone. API has taken out a patent on this cones design, which is unique in that the drivers surround is ribbed instead of smooth. The surround is semi-elliptical rather than semicircular, as in most other subwoofer drivers. The benefits Mirage claims to realize with the Elliptical Surround are three: lower distortion, greater excursion, and better efficiency. The lower distortion is possible because the surround is able to keep its shape more intact as the driver moves in and out. Greater excursion is achieved because the surround has more operating area than a conventional surround. And the new surround is more efficient because it allows the cone to be moved more easily, thus requiring less power. 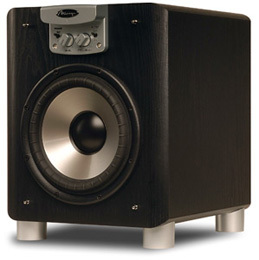 In addition to its high-excursion woofer, the Omni S8 has a large, 3" flared port on the bottom of its cabinet. The S8 is raised off the floor by 1.75" feet, which allows the port to extend the subs bass output. The S8s amplifier is rated by the manufacturer for 100W continuous and 400W peak power. The low end of the S8s frequency response is claimed to be 27Hz, which it easily reached in my room. Hidden under the front grille are the controls: a switch to adjust the phase from 0 to 180 degrees, volume level, low-pass filter control from 40 to 120Hz, and a switch for turning the low-pass filter on or off. An LED under the Mirage logo turns from red to green when the subwoofer is activated in response to a signal. Around back, the connections are limited: a line-level subwoofer input, an Auto/On/Off switch, and left/right speaker-level inputs. Missing are speaker-level outputs, which would have allowed the use of an S8 to offload bass from your main speakers in a two-channel system. I used the Mirage Omni S8 in a system that included a Sony STR-DA5ES A/V receiver and a Mirage speaker system comprising OM-9 mains for stereo, and an OM-C2 center-channel and OM-R2 rears for surround sound. My first impression of the Mirage Omni S8 was a surprising one. It came while watching a fascinating DVD, The Fog of War: Eleven Lessons from the Life of Robert S. McNamara, about the former US Secretary of Defense. I wasnt in reviewer mode; I was watching this DVD for content without regard to its picture or sound quality. The surprising scene was chapter 3, where old footage shows a missile being launched and a nuclear warhead going off. When the deep explosion rumbled through my room, the Omni S8 sounded clean, deep, and shook my walls. I was speechless. I played the scene over and over again, turning up the S8s volume control. There was no evidence of port noise, even with the volume cranked up. This isnt supposed to happen with a subwoofer this small and this inexpensive. Next up was The Matrix Revolutions. This third and final installment of the Matrix trilogy is better than the disappointing The Matrix Reloaded, but still not as great as the first Matrix. Nevertheless, The Matrix Revolutions continues the series tradition of excellent sound. Chapter 5 contains a familiar gun shoot-out with techno-pop music and raucous special effects. This scene didnt faze the Omni S8, which unleashed copious bass. The walls of my room (which measures 14 x 20) shook throughout this battle. Ive heard plenty of subwoofers in all price ranges, and never in my experience has such an inexpensive subwoofer provided so much clean bass. Even cranking the S8 past my comfort zone produced no audible port noise -- something I always hear from other subwoofers near the S8s price. I then played my favorite test disc for instrumental bass: Super Bass 2 [Telarc SACD-63483], with double-bassists Ray Brown, John Clayton, and Christian McBride. This recording surprised me when I first listened to it because it showed how melodic three bassists can sound without piano or guitar accompaniment. On "Papa Was a Rolling Stone," the Omni S8 never sounded out of place with my Mirage OM-9 system, filling in the deepest notes when called on to do so. Remarkably, the bass sounded tight, never bloated throughout this track. I was unable to bottom out this subs 8" cone when I drove it at high volume levels. I had on hand the Outlaw LFM-1 subwoofer ($579), with which I compared the Mirage Omni S8. The LFM-1 is bottom-ported, with a downfiring 12" woofer. While considerably larger (22" x 16" x 22") than the Omni S8, the Outlaws price of less than $600 makes it one of the best in its class -- but its available only factory-direct, so you wont be able to audition it before buying. The two subs performances were much closer than I thought theyd be. The Outlaw LFM-1 played louder and went deeper, but in my room, the Mirage Omni S8 acquitted itself well. I played my deep-bass reference CD, Jean Guillous transcription for pipe organ of Mussorgskys Pictures at an Exhibition [DOR-90117]. This disc contains some awesome sounds; playing the first movement, Promenade, both subwoofers made my rooms fixtures rattle and its walls shake. Where I thought the Outlaw LFM-1 ultimately excelled was in its greater output and depth. Using test tones, I was able to get 87dB at 25Hz from the Outlaw LFM-1. The Omni S8 seems to be tuned for high output in the 30Hz area; I measured about 85dB at 30Hz in my room. Still, this is extremely good performance for a subwoofer of the S8s size and price. At normal listening levels and with pop music, there was little to differentiate the Outlaw LFM-1 from the Omni S8, which again underscores the Mirages value. Playing "Elevation," from U2s All That You Can Leave Behind [CD, Universal 314 524 653-2], demonstrated to me that the Omni S8 could play bass notes with authority and nicely supplement the bottom end of my Mirage OM-9 system -- speakers that are normally used with Mirages current top-of-the-line subwoofer, the Mirage OM-200. At the beginning of this review I asked a simple question: Does the Mirage Omni S8 provide great performance? My answer is a resounding Yes. The Omni S8 is a fantastic subwoofer whose performance shocked me. I have not heard another subwoofer near this price perform this well. Its small size ideally suits the Omni S8 to small rooms, where it will excel. However, it did not sound out of place in my medium-sized room. If youre looking for a small subwoofer, give the Mirage Omni S8 a hard look.